Ready for da Easter Bunny! Re: Ready for da Easter Bunny! I is ready fer dat Easter Bunny Guy, yes I are! I gots a whole list a tweets I wants ta see in my Easter Basket dis year an I is goin ta share wif all my friends! Oh Drew, I wish you was here ta share in da bounty! I wonders if dat rascally Bunny can get a whole chickie in dat tiny liddle basket? I may have ta ask fer a bigger one! Hee!Hee! Oh Emmie Sue, that is the sweetest easter bunny I have ever seen. IOW for sure. There you go again Emmie Sue...melting hearts. You are such a doll. Sitting in bunny bliss . You have our vote for POW. 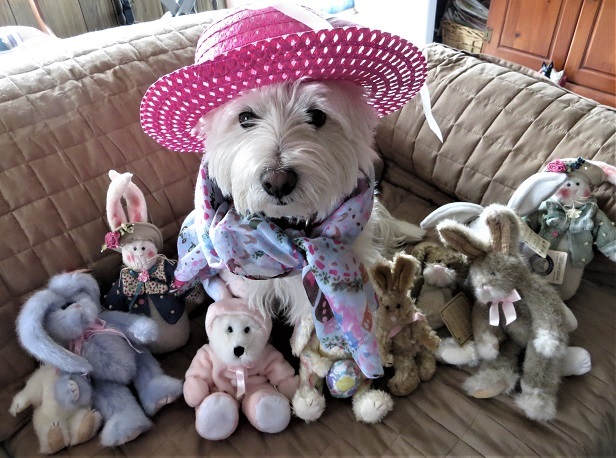 Is that a westie stuffie in a pink bunny suit? TOO CUTE ! Keep these sweet photos coming.